In an interview with The Canadian Press, the Department of National Defence’s head of military procurement says there are no plans for Canada to quit as one of nine partner countries in the F-35 stealth fighter program until after the Trudeau government completes the competition to determine which fighter jet will replace Canada’s aging fleet of CF-18s. “We’re committed to staying there (in the program) until we understand where the competition will bring us,” said Patrick Finn, assistant deputy minister of material at National Defence. So RCAF will get Block 4+ F-35s (which is good), at the expense of losing several years of 5th gen experience and a big middle finger to the force. Any financial gains from cheaper FRP F-35s will be negated by the expenses of stop-gap F/A-18 purchase. All in all, they could have done much worse. I was wondering when someone would post this. This was a major surprise actually... in previous years this basically got barely mention at all, and its in May that the payment is due. This time around its January (months before the money was due), and we have Pat Finn, ADM Mat going out to Lee Berthiume, making statements about increasing the flexibility in the competition and specifically citing other departments (not DND) ability to do so. There's a lot more going on here than meets the eye. I hedged my bets when "interim" SH deal fell through, either after Justin's money counters (I remember those 18 planes came at a ridiculous price) or military people talked some sense into him. How to have a pie and eat it too? The pie being campaign promise to stop F-35 purchase. Answer: don't brake the promise... during that particular term. Between them saying that "actually our Hornets don't need replacement for another 5 years", purchasing ozzy Hornets instead of Supers and him tweeting about LM creating canadian jobs it was IMO quite clear to me - stall tactics until next term. If he gets re-elected he'll be able to pull a Trump and congratulate himself on the fact F-35 are now cheaper and more capable, despite the fact that the force needed new fighters years prior. hythelday wrote: I hedged my bets when "interim" SH deal fell through, either after Justin's money counters (I remember those 18 planes came at a ridiculous price) or military people talked some sense into him. So buying second hand planes twice the age of prospective pilots isn’t making potential RCAF pilot recruits beat a path to sign up? luke_sandoz wrote: So buying second hand planes twice the age of prospective pilots isn’t making potential RCAF pilot recruits beat a path to sign up? 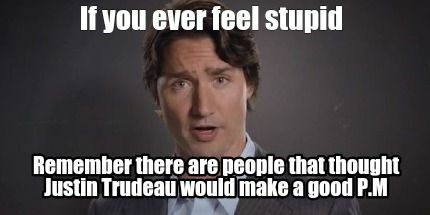 Who knew that a total cuck of a PM would seriously handicap the military? ...A second group of planes would arrive later this year. Eighteen of the Australian F-18 aircraft will eventually be flying for the Canadian Forces, while another seven will be used for testing and spare parts. Canada is paying Australia $90 million for the aircraft. The federal government originally estimated the purchase of the Australian jets would cost around $500 million, but Finn said that price reflected every aspect of the associated deal, not just the cost of purchasing the jets. Canada is also acquiring extra spare parts, the Australian jets will have to be outfitted with specific Canadian equipment and software and testing will be needed. The $500-million project estimate also included $50 million in contingency funds to cover any problems and another $35 million for the salaries of all civilian and military personnel involved over the life of the project. An additional $30 million will be spent on new infrastructure needed to accommodate the aircraft. ...The Canadian Forces says it is bringing in new initiatives to boost the numbers of pilots and maintenance staff." Canada goes retro, circa 1982 for used Hornets! New regulations require all pilots to wear mullets and be able to solve a Rubix cube in less than 10 minutes. Maintainers must be wearing Reebok hi tops and parachute pants at all times. mixelflick wrote: New regulations require all pilots to wear mullets and be able to solve a Rubix cube in less than 10 minutes. Maintainers must be wearing Reebok hi tops and parachute pants at all times. LOL. It's impossible to solve a Rubix cube in less than 10 minutes. He solved a Rubik's cube. As responded to the original post... it is impossible to solve a Rubix cube. "...two F/A-18A single-seat classic Hornets, RAAF tail numbers A21-53 and A21-55, arrived at Canadian Forces Base Cold Lake in Alberta on February 16, following their deployment to Exercise Red Flag 19-1 in Nevada...."